Vintage Art Deco green Opalescent & Vaseline glass perfume scent bottle. Dispatched with Royal Mail 1st Class sign. MJ Unique Glass. 14 CM WIDE. Other panels have been etched which contrast nicely. See the 2 images I have provided showing 2 angles of this area with arrows pointing to it. WONDERFUL EXAMPLES OF ART DECO. COST DEPENDENT ON WEIGHT (UP TO 20 KGS.). Pot has acid etched fleur de lis mark to base, introduced in 1927. made with love by. A beautiful small art deco green uranium glass trinket pot. The pots stand at approx. 14 cm tall and is from the 1930s. A beautiful small art deco glass trinket pot. The pots stand at approx. The item is in good condition apart from the tiniest chip to the side edge of the knob. Very hard to notice. 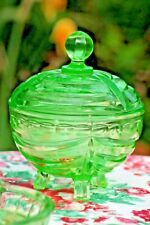 A beautiful small art deco green uranium glass trinket pot. The pots stand at approx. Unusual wine container in clear and frosted glass. It has black outlineing with four gold brush strokes descending in size on clear glass. I think it would be Art Deco as it has been in family possession before WWII. Lovely Vintage Art Deco Cut Glass Bottles Jar for Oil Dressing etc. The second has a small chip on two corners of the lid. the base has a small chip on two corners. One has a chip on the finial of the lid and on one corner of the lid. OVERALL CONDITION - SEE PICTURE. ONE SMALL FLAT CHIP ON THE BOTTOM EDGE (SEE PICTURE 3). NO CRACKS OR RESTORATIONS. A few very light scratches to the glass. Unusually it still has the original Rubber or Vulcanite Puffer, however, this has perished. Could easily be replaced if you wish to use the piece, otherwise quaint use of outdated materials. Unsure of its age but it looks to be pre 1960s. In good condition for age but there are two small flea bites to the bottle and one to the stopper under the flair see photos. Press moulded in good quality clear glass. Anything else, just ask, as we don't bite. much 🐬. STEP CUT SHOULDERS. COMPLEX CENTRAL CUT PANEL TO THE BODY TO THE BODY. TEN CUT PANELS TO THE BODY. As such they will not be in 'new' condition. Super Art Deco Green Glass Vanity Bedroom Set. High art deco period with quality glass and super skyscraper styling. Beautiful period set. super ground stopper. 12.5 cm long. One atomiser. 12 cm tall. GILT GREEN GLASS. SCENT BOTTLE. WILL ADJUST AUTOMATICALLY. HAND MADE AND DECORATED. AS THESE FORM AN IMPORTANT. Pattern is Heavy Vine in marigold, also may be known as Balmoral. The smaller bottle is paler in colour, stopper is intact and a good fit, around 5" high. The larger one is a good strong colour with a large base chip on the stopper, around 7" high. Vintage Cobalt Blue Embossed Glass Bottle with lights. Lovely cobalt blue glass bottle. - Includes battery powered lights added by myself! Embossed Glass Bottle. 2 X POTS 9CMS X 6CMS X 4CMS HIGH ~ ONE HAS TINY FLEABITE ON RIM, OTHER HAS TWO FLEABITES ON RIM OTHERWISE EXCELLENT. SUPERB DETAILED CUT. BIT OF EVERYTHING! NO MAKERS MARK. Trinket Box height - 155mm. There may be colour variations between your screen and the actual colour of the object. Better to do it now than later! These should be generally expected. Beautiful faceted blue glass art deco scent bottle. 5.5 cm high stopper off. 8 cm high stopper on. FOR SALE IS THIS PRETTY ART DECO SLICE CUT SCENT BOTTLE. TYPICALLY ART DECO IN STYLE. BEAUTIFUL QUALITY CUTTING & WOULD MAKE A LOVELY GIFT WITH A FAVOURITE BOTTLE OF FRAGRANCE. HAS A LITTLE STAINING TO THE VERY TOP NECK WHICH I CAN'T GET TO TO CLEAN. Lovely 5 sided cut glass scent bottle. Has a screw in lid with a glass dropper. Stunning cut glass oil / vinegar bottle. Pineapple and diamond pattern deeply cut to maximize. Beautiful faceted blue glass art deco scent bottle. Fan shaped body. Engraved Glass Bottle. Base: 7.7cm x 7.7cm. LEADING DOWNWARDS TOWARDS A PANEL OF FINE VERTICAL SLICE CUTS ABOVE PANELS OF TRIANGLES INVERTED & UPRIGHT WITHIN TRIANGLES. STARTING WITH THE FACET CUT LIDS WITH STYLISH MILLED EDGES, MATCHING THE NECK OF THE BOTTLES. Nicely presented with original lable and lid. A beautifully made French glass opaline glass scent bottle, wonderful period design. FOR YOUR CONSIDERATION IS THIS FAB, ART DECO DEEPLY CUT GLASS DRESSING TABLE POT. 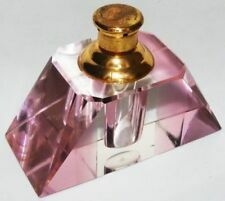 A fine Art Deco multi-sided cranberry glass scent bottle with a square cut solid clear glass stopper. With 12 flat cut sides the bottle has a graduated intensity of colour to the body and is not marked. 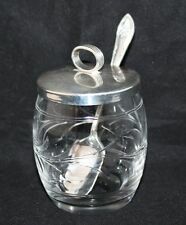 FOR YOUR CONSIDERATION IS THISFAB ART DECO GLASS HONEY, OR OIL POURER. HAVING A TALL BEEHIVE SHAPE, SMOOTHED POLISHED PONTIL TO BASE & A POURING LIP. HAS PLENTY OF AGE RELATED WEAR TO THE BASE & GOES THROUGH THE DISHWASHER. MIKASA Poppy Flower Wine Bottle Stopper Clear Austrian Lead Crystal New In Box!